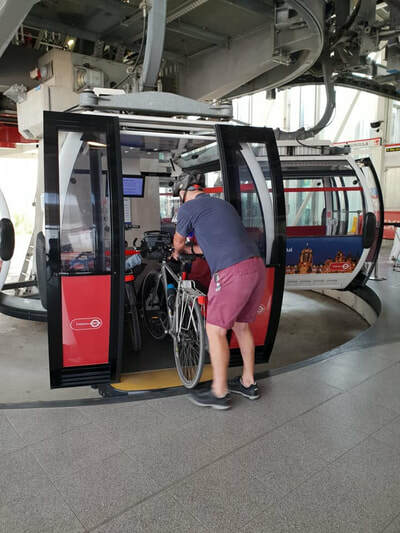 By Air and Under Sea - Healthy Ride from Greenwich to the Olympic Park, via the Emirates Airline. July 21st, 2018. 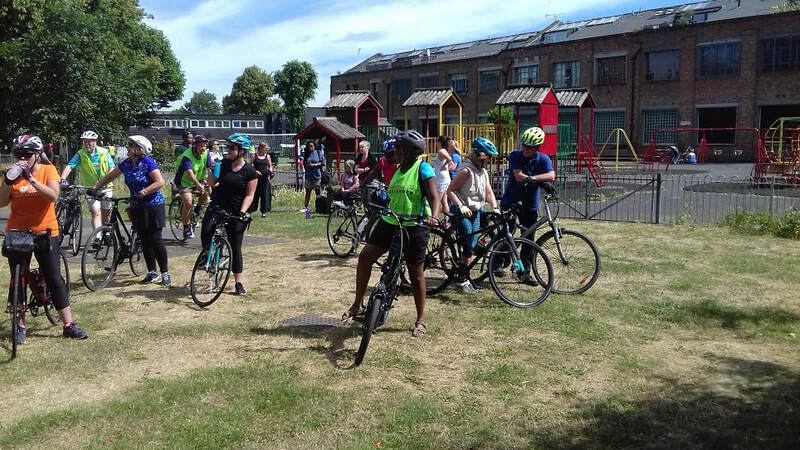 Report from joint ride leader Philippa. 17 of us set out from the Cutty Sark in Greenwich on another hot and sunny day. 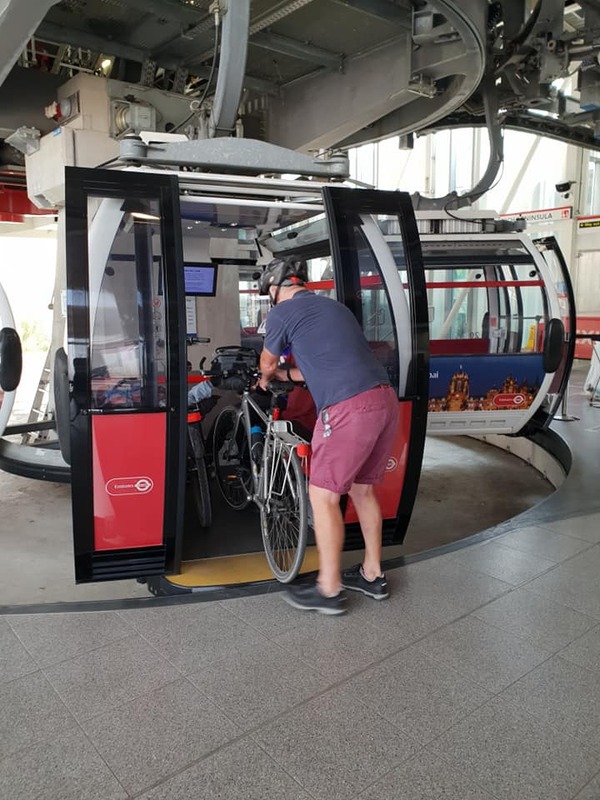 Headed out on the Thames pathway diversion to stay clear of the narrowest sections rejoined by the golf range and then rode past the O2 to the Emirates Airway. 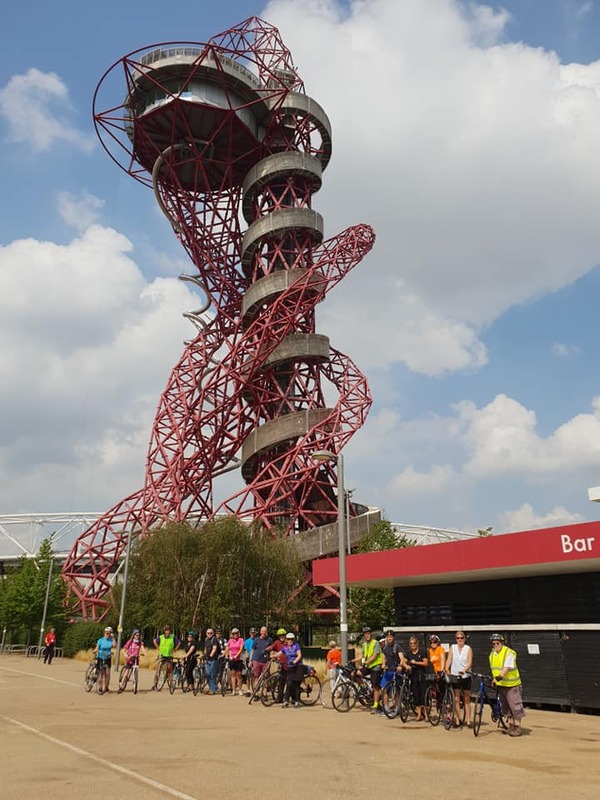 All boarded safely and enjoyed a gondola ride across the Thames with spectacular views including of the Arcelormittal Orbit in our destination of the Olympic Park. On disembarking we met up with an additional 2 riders making us 19 in total. 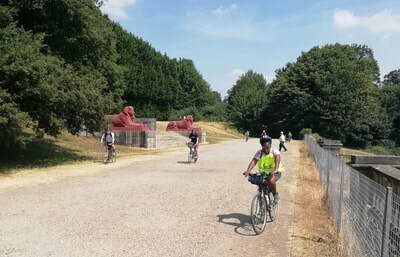 We then headed off going down Silvertown Way (A1011) across Newham Way through Malmesbury Road park and following the marked route through the Memorial Recreation ground exiting left (new ramp onto the Greenway not completed yet), past West Ham station then right turn onto the A1011 again for a short stretch before taking the ramp up onto the Greenway. Then on to the end taking a right onto Cycle Superhighway 3 taking a left at the crossroads down Warton Road and taking the path at the roundabout into the Olympic Park. We paused for a group photo at the Arcelormittal Orbit and then headed through the crowds of people making their way to the World Women's hockey to our coffee stop at the Timberland Lodge. Park was very busy with hockey crowds so Chau Li offered to lead us back to the View Tube via lesser used paths. A good choice and a nice route through, with a look at the hockey crowds as we rode round the outside of the Velodrome! Amanda then took over for the return leg down the canal through Three Mills and Cody Dock. Said farewell to Chau and Jill there as Jill got a puncture and they didn't want to delay us. So on down the Lea River and into the Millwall Dock and back via Mudchute underpass to the north side foot tunnel. Back at 1.19 so slightly over time but all enjoyed the ride. Really good that Chau was with us and led us through the paths under the main route - very scenic too. We could have managed without him but it made the ride much nicer. Only realised the Athletics were on in the stadium too when we were on our stop! People enjoyed the route being mainly off road too. Will be even better when the ramp is completed allowing access direct from the Memorial Recreation ground. Image of route below. Thanks to Amanda and Philippa for leading and to Philippa for the report and photos. 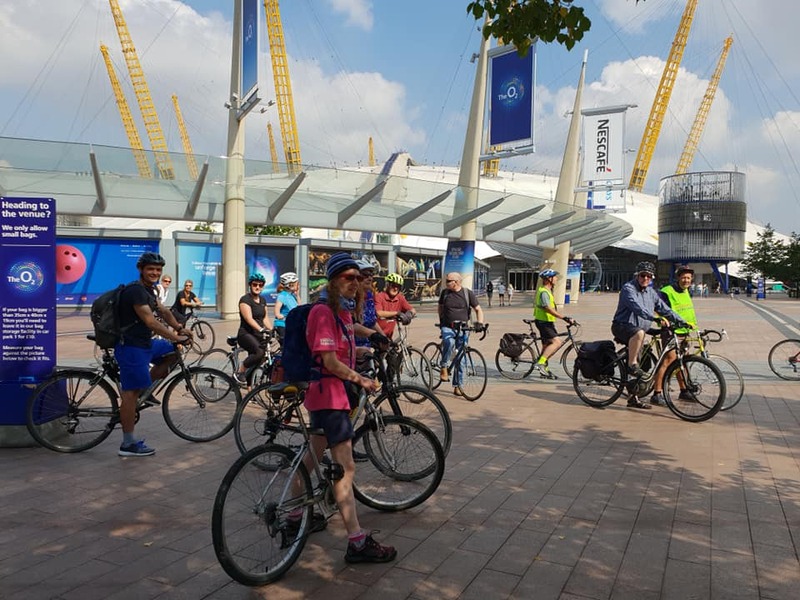 17 riders at Canada Water on another lovely day. 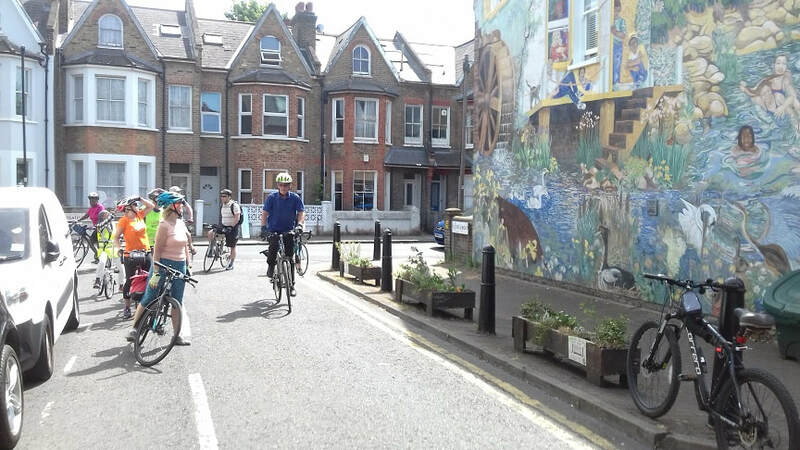 Headed off to look at places where new cycle routes might be created. So not the usual scenic ride! First stop just across the shopping centre car park next to the petrol station. This is where phase 1 of the planned redevelopment of the Canada Water area will start if planning permission is approved (more info here). A new wide pedestrian/cycle route will be created linking Lower Rd and Southwark Park to the new shops and leisure centre in the plans. More of this later. July 7th, 2018. 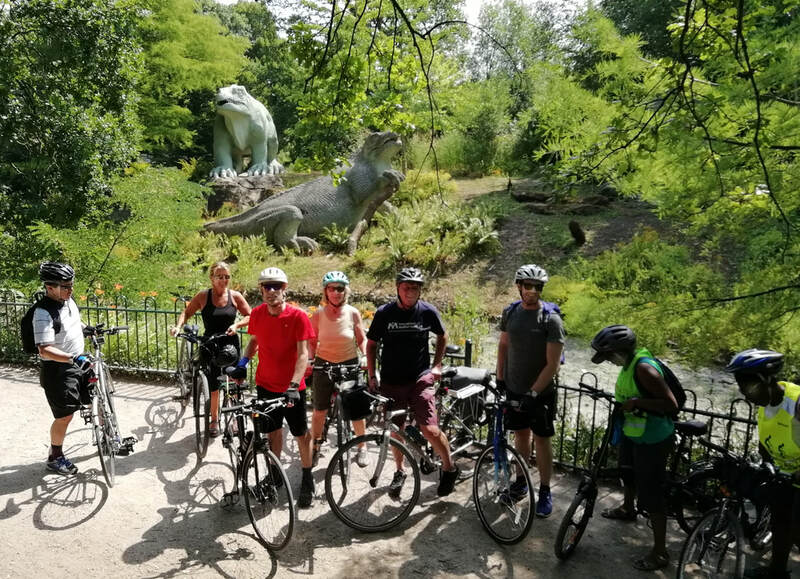 Crystal Palace Loop. Just 10 cyclists at the Dulwich Clock Cafe on a day with 31 degrees forecast and the quarter-final game in the afternoon. Checked everyone had water and sun cream. Started out east through the Court Lane gate and via Peckham Rye Park to Ladywell Fields. From there south along Waterlink Way (NR21) to Cator Park. Very hot by now (just 10.30 am) but pleasent along the leafy sections at an easy pace. 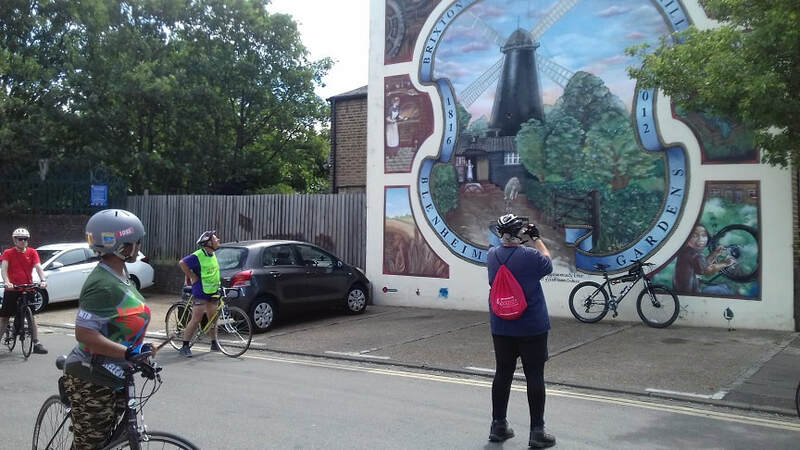 After a brief look at the 10,000 miles sign (Sustrans National Cycle Network) rode up Lennard Rd, past Penge East station and into Crystal Palace Park. Round the south side of the lake past the dinosaurs, then up to Crystal Palace Parade. Plenty of shade on the steep bits which we took at a leisurely pace, even walking at times. Cut through on grassy paths to Old Cople Lane. Poked our noses into the Caravan Club cam site. One rider who had long lived near Crystal Palace Park had not realised there was a campsite there. One of London's "hidden spaces". Relaxing long downhill (Fountain Drive and College Road) run saw us back to Dulwich Park just after 12. And it had been hot! 11 miles, mostly quiet roads or paths. Route at https://goo.gl/rfUzwn or .gpx below. 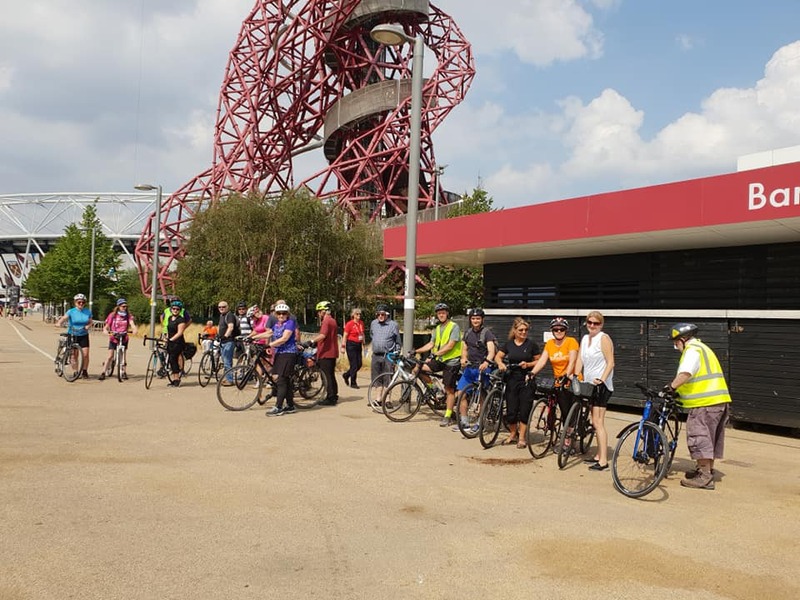 27 riders met at Canada Water for a + ride, this being the 5th Saturday. After the usual route along the river we joined Q14 in Tanner St and followed it to reach CS7. From there across Southwark Bridge and through the City, into Hackney and London Fields. Admired the cyclists slow signs, then across to Victoria Park for a coffee break. 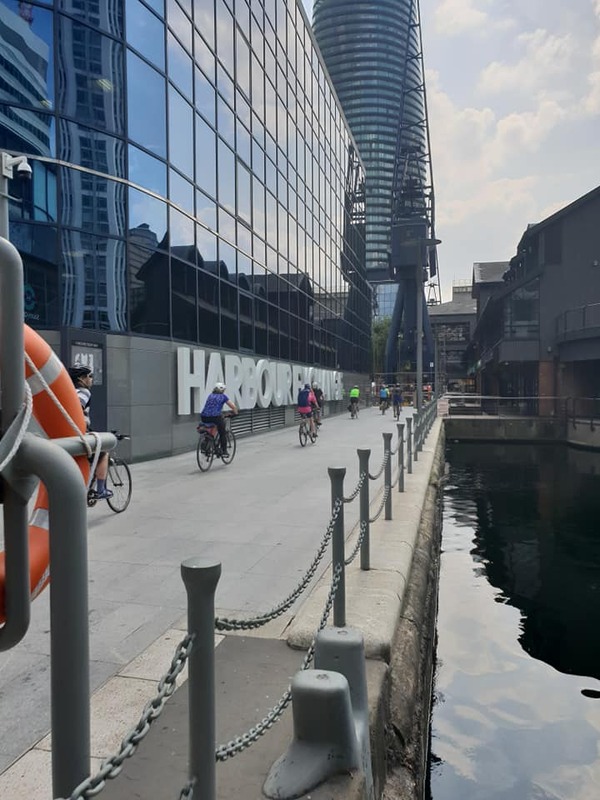 Back by the familiar route down Regent's Canal to Limehouse and through Wapping to Tower Bridge and along the river back to Canada Water. Route file attached below. Longer report from Ride Leader Werner on Southwark cycists web site. Seven Murals and a Windmill. 18 riders set off from Peckham for a tour around Brixton and the Windmill locating the 7 murals. Out via Burgess Park, Myatts Fields and Loughborough Junction. First stop on Coldharbour Lane for "Nuclear Winter". Then across Brixton Hill to Brixton Mill, looking a bit sad as the sails have been removed for essential maintenance work. 2 murals here, the children's mural on the wall near the mill and the mural of the mill itself along Ramillies Close. Not far to the next mural, a tribute to the "lost" River Effra that is in a pipe nearby. Next through to Brixton town centre where we viewed 3 murals. There was also a bonus mural, not on the list, in Blenheim Gardens, "Say it loud" (from James Brown song, 1968 that became a black power anthem, see nice video here). Great fun was had by all and the weather was lovely too. Harry leading. Route and information sheet below. Report on ride June 16th, 2018. 19 riders at Cutty Sark on a pretty nice June day. 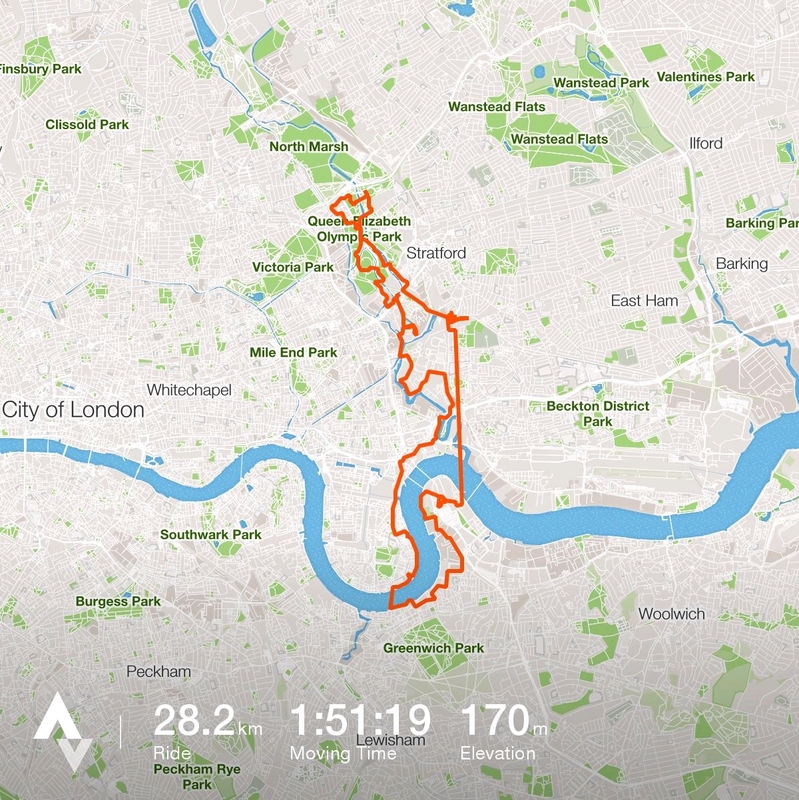 Across the river and through the Isle of Dogs to the Royal Docks. Plenty to see. F1 boats hard at it on Royal Victoria Dock. Plane taking off at London City Airport. Check out Philippa’s videos (Powerboats at Victoria Dock, https://www.facebook.com/philippa.goffe/videos/1512772605517529/; Plane taking off at city Airport, https://www.facebook.com/philippa.goffe/videos/1512773172184139/). 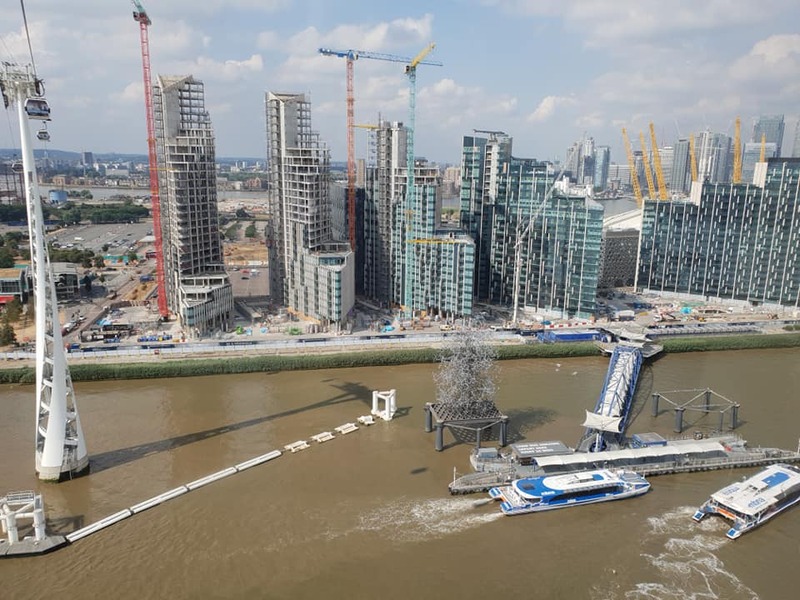 Across the river at Woolwich to the Thamesmead Tor, then home via Thames Path, past the Barrier (new section “the missing link” not quite open) and back at Cutty Sark sharp at 12.57. Many thanks to Amanda for leading and Debbie for acting as back marker (usual back marker David had a puncture before the start). Route below. 18 cyclists in Deal Porter Square on a cool June morning, but with a sunny forecast. A 19th cyclists joined us en route, so a decent turnout. 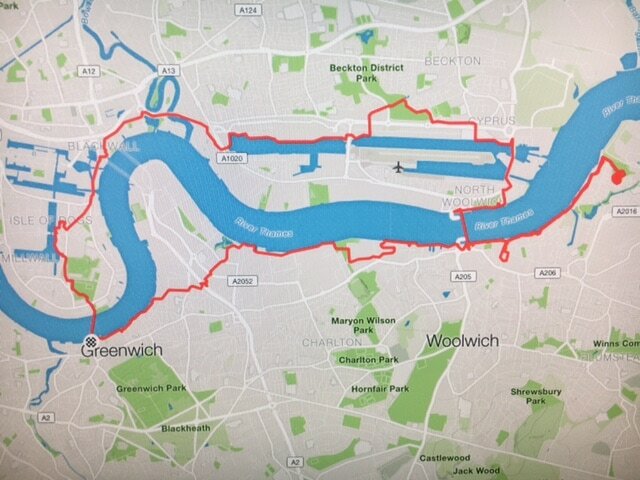 Headed out past Greenland Dock and along Oldfield Grove to Q1 at the start of the Millwall Path. 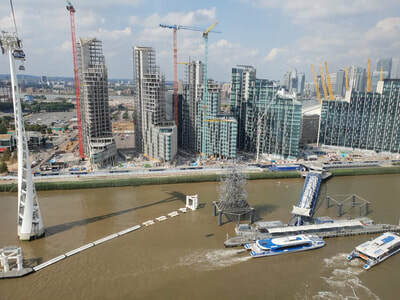 Then followed Q1 past The Den (Millwall Football Stadium), over the Connect 2 Bridge on quiet streets to the South Bank (passing the Old Vic theatre on the way). Had a short break next to the National Theatre then headed back along Upper Ground to Superhighway 6 which we followed for a short distance to the start of Q14 at Nicholson St. Q14 is a work in progress, but we enjoyed the 2 new modal filters at Gt Guildford St and Newcomen St and the new crossing of Tower Bridge Rd. That is where Q14 ends at present. We continued mostly on the existing National Route 4 following the route proposed for Q14. At the Albion Channel, turned off NR4 and followed the Channel the short distance to Deal Porter Square. 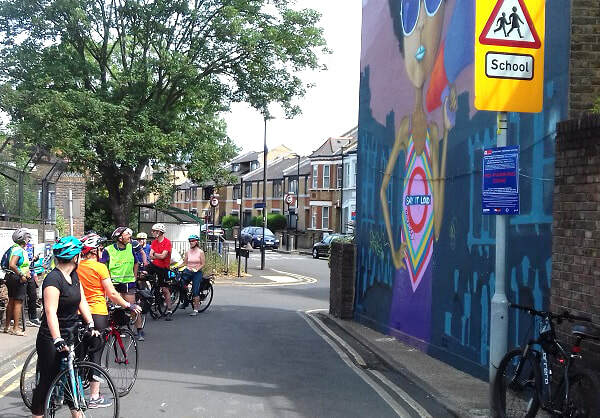 The first part of Q1 was the nicest cycling, and this route has become popular with cyclists. The more central parts of Q1 and Q14 are more stop-start. These routes are really better thought of as "Central Grid", their original designation by TfL - they are never going to "quiet". 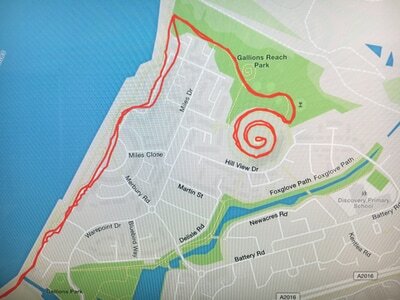 On a Saturday morning roads were reasonably quiet and the elongated loop route using the 2 Quietways provided an enjoyable excursion. Route map at https://goo.gl/kV6jUB, gpx file below. Just 8 riders at Dulwich Park Cafe on a pleasant morning. Headed off via the Rosebery Gate. This means joining the South Circular for a short stretch. There is a dual use pavement but it is on the wrong side of the road for the ride. So carefully cycled on the quiet north-side pavement to the junction with Lordship Lane. Just before the Hornimam Museum, used the cycle crossing to Sydenham Hill. Some cycled and some walked this short stretch of steep uphill. All were rewarded by the glorious run down to Sydenham along Kirkdale. At the bottom we were missing Simon who had punctured and decided to abandon the ride. From Sydenham station quiet back streets (LCN 62) to Cator Park. Rode round the park then stopped at the small post that commemorates 10,000 miles of National Cycle Routes (see photo). The marker is on National Route 21 and we now followed this for 4km, nearly all off road on well-surfaced path. Turned off shortly after the confluence of the Pool and Ravensbourne Rivers to join Catford Hill and head back towards Dulwich. The route with least uphill is via Honor Oak Park so we used this. From the top rode down to and through Camberwell Old Cemetery. We were in excellent time so decided a final challenge - Dawsons Hill - was in order. We were rewarded by terrific views back to central London. The haze from the previous few days had gone and the panorama was as clear as you could wish, all the way from Nine Elms to Canary Wharf. Carefully down the zig-zag path off Dawsons Hill and into Dulwich Park. Everyone substantially fitter than at the start (although they may not have fully appreciated it at the time). Route map at ﻿https://goo.gl/SdXbx8 or gpx file below.